What painting would you hang here?? I do not think the rug was a mistake. You paid a lot for it because you obviously liked it a lot. This might sound silly but if you could get it up against that wall you may just be inspired concerning the colours that you would like there and in what format. All suggestions are coming from a desire to help but I do think that what you like is paramount. Muted and neutral and wishywashy is trendy and very much the like of those who shy away from colour, but you have something colourful if that is what you want.Lets face it...all paintings and even prints fade over time and the light coloured ones will do this much faster, they do not have to be in direct sunlight....neutrals will soon fade away. I like your cushions and your rug! You did not ask what to do with these...you asked for an artwork to complement these. its out there, look online, there's so much to be inspired by...and yes, why not have a go yourself? Sometimes people advise in accordance with trends or in accordance with what are their personal preferences. Be the individual you obviously are in this choice! As an afterthought...have you considered one of those wallpaper murals? Some of them are so very classy...or even a Decal? Look online. I am certain you will find what appeals and also 'goes' with what you have there already...lovely, unique rug, colourful cushions = character! This is YOUR living room! Quite right ladyrob1. It's Hilda's living room. People can only offer suggestions based on what they themselves would do if it was their room. @dooenmabest No, people should remember that the other person is not they. The other person does not want what 'people' themselves would do = throw the rug out, get rid of the cushions, "no painting" etc, etc, Hilda asked specifically "What painting?" To me it is obvious that Hilda wants artwork on that wall. She has a lovely rug that she obviously likes a lot and cushions to match...also that she likes. Hilda is asking Houzzers to help her resolve what she wants because maybe selecting artwork is not her forte. That's different from going into a room or a house and doing a complete turn around, throwing out Hilda's expressions of herself and substituting these with ours. Hilda asks for suggestions to finish her own inspiration rather than asking what she can have instead of her own ideas.... that she has obviously resolved to her satisfaction. OK, designers look at the whole but Hilda is not asking for a design brief and to engage an overall designer because she does not know what she wants. She rerquests assistance in finding the finishing touch to complement what she has already managed to realise. Take a chill pill ladyrob1, I was only offering suggestions to tie the whole room in. But sure, you go ahead and take control of this feed stopping hilda from hearing all the options. HIlda, all I can suggest then is take in everything that has been suggested by everyone, and use what best fits your style. Suggestions are just that, suggestions. Well, I'll be brave and offer another suggestion. Looking at your carved foot stools would you consider some wooden carved wall art? Something simple like this? This carved wall art is great - and the colour works in with my idea of a sepia abstract. 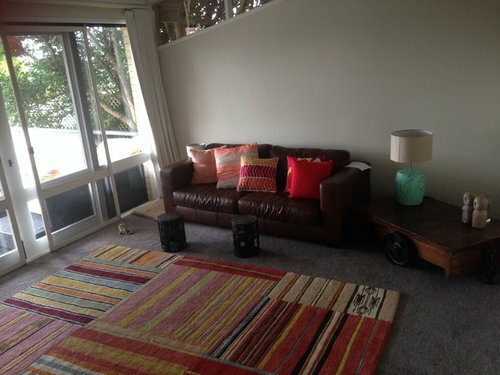 I also like the rug - its quirky and loud and full of character. Whatever you choose for the wall piece in my opinion, needs to be subdued - then the other pieces will make the statement. I love art and so am biased in thinking you should buy art that you enjoy looking at every day and appreciate the way light brings out new dimensions in the piece. That being said, once you find a piece that you love, use cushions to enhance it by all means. However many people simply love the colours in prints to tone in with their other furnishings. That is brilliant suggestion re wooden artwork. Neutral yet with depth! Where would I locate such abstract art pieces please! Thank you!! I saw the art on Etsy. I liked that the vertical lines of the trees mimic the vertical stripes in your rug. 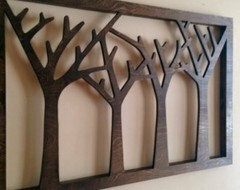 Just google wooden carved wall art and lots of examples will come up. I like the shelves very much but feel they are the wrong shape, I think something long and narrow to complement the size of your lounge and go under the window is better (but that is only my opinion! ) The good thing about the shelves though is you could change the display as often as you like. You don't want to crowd them with stuff though and make it too busy. Plus the dusting of them would drive me crazy! But if you love them then go for it, there is no right or wrong, only what you love. 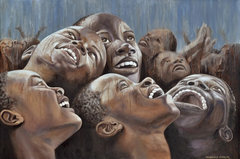 As others have said the best art is something you just fall in love with and it will bring you joy looking at it every day. Found these on etsy but unfortunately in Canada. Now the challenge is finding someone (carpenter?!) who will be able to make this! Nice but I think it's a bit too busy, it's very busy like your rug. You want something to complement your rug, not compete with it. But I'm no expert and you obviously really like it. Good luck in your quest! Great! Creative juices flowing in the right direction now...Hilda's direction! @ Hilda, lots of great ideas and products on Etsy and having made purchases from some of those delightful ecclectic sellers I';ve found that items ship from overseas speedily and without mishap. You have probably investigated this- but how would the cost of doing that compare to the cost and time and maybe the concern of getting exactly what you see here from a local carpenter? I've found that it is often more cost effective and less worrisome to buy from Etsy....Not very patriotic if that is a concern, but much merchandise being resold these days comes from overseas. @ Jayk Newton...now look what you've done! I agree with Zen Garden's very first comments and that is, art is very personal and when you find that "something" you will know!!! Case in point, I have seen a lovely driftwood display for a table with succulents on Houzz and I instantly fell in love with it, so I went to the beach and found my own piece that I will prepare and fit out myself. I can't wait till it's on my table but hubby cringes that it's actually going in our house ha-ha. Bottom line is, you will know when you are looking at a piece of art that "flicks your switch"
I'm astounded with the countless posts providing you with a huge choice of artistic possibilities and interestingly, I really like Jayk Newton's rice fields and also the triangle frames that you found!! In my earlier post I mentioned that there was too much colour for me but I do still like it especially the carpet, just for me personally, it's too much colour in a room but you go girl!!! Hilda...With all these creative ( and not so) ideas flowing...and it being obvious to me that you know what you want but its not "jelled"(?SP) yet....time to ask you if you would, as I am a big fan of the unnusual...WHERE did you obtain that rug please? wonderful constructive ideas roaring along here, all in Hilda's direction! @ Hilda...I wish you speed in finding that illusive piece that you can add to your room ...emphasis on 'add' rather than on 'ditch'. 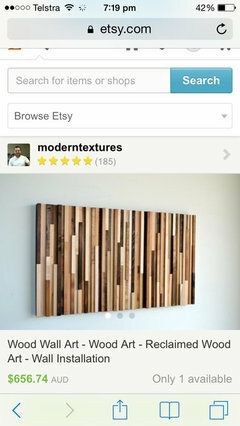 I love the Etsy item of found timbers especially its unique "put together piece by piece" appearance picking up, in natural earthy neutrals (that won't fade), - the design of your exciting rug!. @ Barbara, I have no hubby who will cringe at anything I accomplish, good on you making that driftwwood sculpture! PIC? Always love to see what comes from that determination to have what you want and like despite....for many a lesson to learn! @Jayke...first there's no need to be rude or to take offence at anything here especially when your "suggestions"appeared to have had Hilda doubting her own crative flair, thinking she'd made a mistake with the rug! I too, along with others, expressed what I would do "if the room were mine"...that's not the right approach! Its a designer's job to support. I've witnessed many a teacher demolish a student's enthusiasm and individual creativity and replace it with a version of themselves and their style. I may be, in your opinion taking this too seriously but individual artistic expression is so very precious and should be nurtured not dampened . I do not think anybody could stop Hilda from doing it her way! @ Barbara- With Barbara the effervescent I say to Hilda "You go girl!" @ Jake..Maybe you need to start a room of your own. 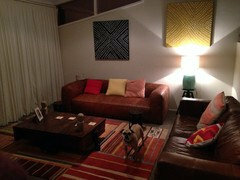 We got the Rug from Norway through an interior designer contact so not too sure where you could get it in Aus. (She mentioned it retails for about $5k in Aus) I will check the brand and you can research it, I am sure by having the brand could bring you to an answer in Australia. Alternatively I can ask this lady we know. I will keep you all updated with progress. Thank you. This forum is wonderful. Hi HIlda! Frstly thankyou for the details and the offer to keep us all informed about the origin and maybe procurability of your rug..Next I felt that maybe it had a scandinavian origin...those things, especially the quality, are not always obvious in photos but your PICS are enough to ..wet one's whistle. Even if I had to save for a year and that rug were procurable and tantalising me I'd just have to..."put my Moz " on it! What is the main fibre and I suppose it might be specialty item? Thanks again for this response...something to hope for! And YES, this forum is wonderful.....and I'd bet I am the oldest subscriber in OZ too! Try putting the rug under the front feet of the sofa. The cushions should pop more. Also you can buy balsa wood relief. I have seen three panels. The trees were cut in showing the wood with the balance in black. Very effective. Hilda...if you have not yet chosen your artwork...and for what this is worth, I came across a site called Light in The Box...you might like to google that..since you appear to be competent at grabbing ideas from the internet. There was a section on oil paintings for sale...all kinds for all tastes. One in particular (which I was unable to grab not being very clever with the computer) featured a room with a couch much like yours with a line of lovely colourful cushions and a painting over the couch the length of the couch. It struck me immediately as resembling your room and your couch. 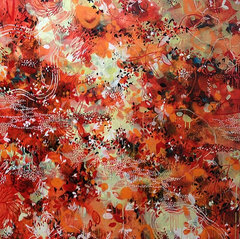 Bear in mind that this 'painting site' sells mass produced works, some of the reviews state that one does not get exactly the featured painting...however, there are heaps of different ideasto inspire... and that's the good part. 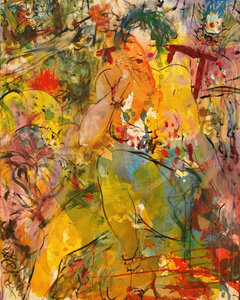 Most of the works are very colourful and maybe not what you are looking for but you may know someone who could create for you based on ideas on that site. Great Lesley! I did not know about that one! What about a wall tattoo? @ Jackie lruger...what is a wall tatoo? large black and white photos! I would forget the artwork, move the couch up a bit from the windows and put a large Golden Palm in the corner, softening the room. Then perhaps a black and white portrait shaped framed something on the wall, perhaps! A smart standard lamp to balance might be nice! To all contributors here...was watching a home renovator program a couple of evenings past....":Oh Joy, What Bliss" ( Bette Midler in Beaches)....COLOUR is back! Gone is the En Trend stark white muted non-colour minimalism....gone the white dinner sets on white table cloths set in pale rooms without gutz...(.and please white and pale and nondescript "elegant" devotees don't take this personally ...you are allowed your preferences...) But I am so happy that everything, from garden decor to tableware is colouring up...the tableware is brilliant and mismatched and bold and...many of the the artworks on the show Reno Rumble are trending on riotous...makes me happy and I'm back to painting riots of controlled colour...just enough subject matter to still the explosion. Hope it takes on in a big way, certainly the up market home decor businesses are already reflecting the trend...and the artwork is not amateurish either which is even better. Hope, Hilda, that, having found your perfect solution, that it is still en trend to your liking...otherwise this colourful wind that's picking up might have you looking for something new that grabs you and is also "with it"...if that's a consideration at all. Best of luck and most of all..ENJOY! Have you found a solution? Giving you all an updated look soon. Found some art- will post pic later. Now also considering adding another couch ;-) endless! 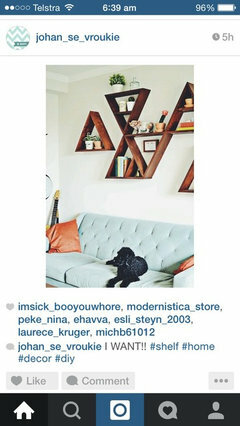 @ Hilda that's a nice sleek couch! Do you think that the other one was too busy? @ Hilda... It's a Hilda Hit! I like the cushions, for me, they fit in with that gorgeous genuinely earthy-looking rug AND the paintings...Are the cushions really too busy ? I like how everything reflects everything else....like a mirror....Hilda's HUB, Hilda's Woom, Hilda's Happiness! Congrats Hilda on holding on to your unique self expression ! Its so comfy and inviting and....if it is important to you..... the latest trend is...COLOUR...and it doesn't have to match perfectly....it just needs to be self expressive and to do what you have achieved here....reflect, in a way- refract and...... cuddle into the other colours...like the turquoise lamp base does with those stripes of the same colour on the rug. Just one question...What do you think of mustardy yellow curtains to reflect ground of the painting on the right as well as picking up that same yellow already featured in those cushions and in the rug? The whole room would be a painting! As it is..It Tingles! .Quite an unexpected result and I LOVE IT! Update! New couch is in! Now for a throw and pillows and make it move around a bit!!! Great job, actually like the wall art and cleverly placed!! @ Hilda Tingle ha - ha - ha...There's a saying in Italian..."Bertoldo, schertzando, si confessava". Basically means that a joke can often hide an untoward or inappropriate intention. 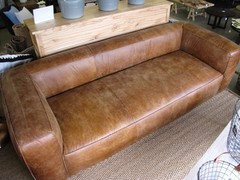 Just because you have decided to replacer a leather couch does not mean that you are required or obliged to relinquish the replaced items through Houzz to...whomsoever asks for whatsoever cost or for none. That you did not answer such a message in the first instance should have been enough of a response. Is one of the functions of Houzz a Trading Post or..... an..."Opportunity" Shop? Frankly I am somewhat agahst at and feel embarassed by the persistence of that ha-ha-ha Houzzer, and that any Houzzer would canvass others in this way pretending its a joke. Of course it would be a different situation had you offered. 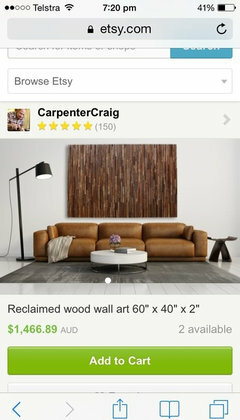 Maybe, Houzz, should these kinds of approaches/negotiations be done in private? Well done Hilda! Its a difficult task to find exactly what reflects one's personal decor ideas. I was initially surprised by the paintings but they are the perfect choice. Its all coming together as if it was always there...and in a way, it was...you just had to find yourself out there in the shops! Ok moved around a bit! Making more work for me as now we definitely need something in corner! Hahah to put the lamp on. I like this layout and yes, sorry, you will need a more substantial table for the lamp, as the furniture is quite chunky, my furniture, both couches!!! Seriously though, lovely job with the room!! I think the rug and furniture couldn't take another abstract type artwork as it could become too busy and loud. I would go realism... 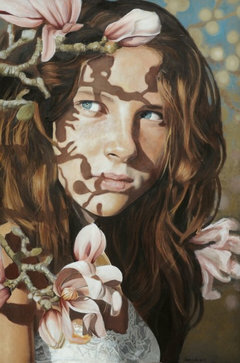 Check out my paintings below and visit my website for more if you like :) www.rebekahcodlinart.co.nz. 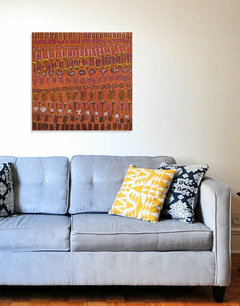 I ship worldwide and all my paintings are available in several sized Giclee fine art prints on canvas or paper, ready to hang. @ Hilda Tinkle...LOVE your room...mostly love the rugs and, in my view, those artworks are as if they were purpose commissioned ! "The whole" I am sure reflects your personality! Its been very interesting watching it all grow. As for replacing the lamp stand, personally, I really like that stand both for the room proportions and... for that friendly, substantial chunky lamp. I feel...and that's "feel"....that I'd want to put some sort of novel,decorative, low, longer, narrow, open construct couchside table/magazine/book 'depository'/drink putter-on (phew) at the side of the couch ...a proportionate space away from the side of the couch...something that has room for the lamp at the end to sit exactly where it does now under the yellow painting....Or, keep the lamp stand where it is and add a little bit of decorative yet functional whimsy at the couchside. It would need to be the perfect thing...I see a little nest of small decorative tables in my mind's eye...just feel you need to relieve the substantial solid feel with something that looks light and.... airy?....hard to describe, just a mind image. How about one larger cushion among the array of small ones? I've not seen your room for a while. I love what you've done..dignified, furnished in quality items and more to the point..themed ! Imagining myself relaxing in that room along with a friend or two....find myself wanting something tall that draws focus, maybe that accentuates the purpose of the room or calls attention to the theme...just a thought. I spent my early childhood in the Pacific and was surrounded by artifacts and furnishings that had the same "feel" as your room. I am really impressed by your attention to detail and how you've managed to assemble it all so it appears purpose made to go together, Congrats on ...substance ! Where did it all start...I've forgotten....with the rugs? Hi Hilda - looking at that rug - perhaps you can put it on the wall vertically - if it isn't too heavy to hang ( as this will carry your eye upward and almost remove the triangle of open space) - it is an art-piece in itself - and I agree with the person who said to pair back the cushions - only have very odd ones - as the couches have also got quite a bit of colour. Not sure if anyone else has posted this but have you considered painting the wall behind the lounge the same colour as your carpet. I love all the colourful pieces but you need a solid base to bring out the tones. Once I had painted the wall the dark colour I would def choose a piece of art/mirror that is made of reclaimed wood...it really has the bohemian vibe and is needing that natural element to it. There's a lot of potential with this space and you have so many choices of artwork that would compliment your decor scheme. As you have such bright, vibrant colours in the rug and cushions, we would recommend a piece that subtly uses a similar palette. 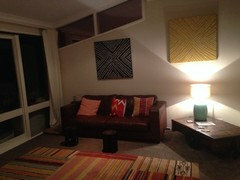 With regards to style, an Aboriginal artwork, animal, abstract or people/portrait piece could be a great choice here. 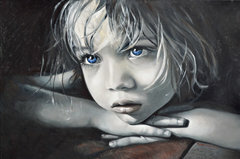 Bluethumb Online Art Gallery has a variety of styles, colours and prices to suit every budget. 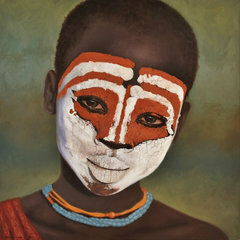 Below are some example pieces of some of the artwork available on Bluethumb. We also have a free art advisory service with our in-house interior designer! Why not get in touch with her at help@bluethumb.com.au and find your perfect piece that way? Best of luck with finding the right artwork for you! Should I hang this painting here? What would you rather put on your walls? What colour would you paint the walls in a home for sale? Weatherboard Makeover: What Would You Do? I am looking for pull down cloths hanging rack here in Victoria Aust.